When I post recipes, I like to include a step-by-step photo example how to make things. This recipe, however, is so simple that step-by-step photos would seem silly. It literally takes under a minute to make. I decided to make Pumpkin Whip Dip for a Christmas Ornament Exchange Party. I got inspired by one of the blogs I follow and decided to put her recipe to the test! Looking for more amazing dips, baked goods and unique party dishes? Check out her site…it’s filled with them: Love Veggies & Yoga. It was a hit. Okay, it was more than a hit… they LOVED it and I think you will too! *serves enough for a large party of people. 1/2 can pumpkin, 1 cup of whip, 1/4 cup of brown sugar and 1/4 tsp vanilla extract, pumpkin spice & cinnamon. The recipe is SO easy, I don’t think I really needed picture how-to’s anyways. There are several different versions out there that includes adding cream cheese, vanilla pudding, or yogurt to the base and even nutmeg, cloves and caramel sauce. Although all of that sounds deliciously sinful, I had a goal to keep this dip more on the healthy side. The worst thing involved is the brown sugar, and you could replace that with splenda, truvia, or stevia if you prefer. 1. Thaw cool whip by placing it in the refrigerator before hand, or out to room temperature. 2. Mix whip and pumpkin in a large mixing bowl. 3. Add in brown sugar, vanilla extract, pumpkin spice and cinnamon until well blended. 4. Stick dip in the fridge to cool, or serve immediately! 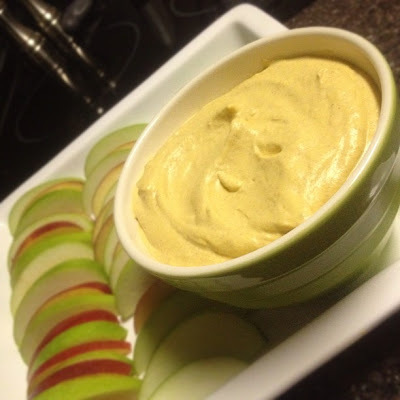 I served this dip with red and green apples because I like the taste of sweetness combined with fruit. Pumpkin Whip Dip would also go great alongside gingerbread cookies (more Holiday flare), sesame crackers, pretzels or graham crackers. If you have a minute, you can have all the whipped pumpkiny goodness you can handle. Enjoy!